Home decorating is a fun challenge for many. Making that design truly your own - pulling in elements that mean something to you and your family, adding a focus piece that you found at an estate sale - these are some of the things that make a house a home. How do you tie these eclectic elements together? Carpet! After all, your carpet is one of the largest design elements in the room. Kermans - Indianapolis' best carpet store has three fun design tips that help you make the most of your space. Looking for a comfortable but luxurious feel? Don't shy away from color when looking to tie this look together. Look for deep, rich colored carpets in indigo, wine or other jewel tones. Consider mixing in some layers in the floor that mimic the layers of different design elements in the room. Add a thick area rug on top of your carpet for an extra luxurious touch. If your room design includes metal pieces, you can even look for a carpet or rug with a metallic fiber woven through to subtly pick up the tones. Want to create a simple retreat? If your life is too busy and you'd like an in-home retreat that is a calming, comfortable space look for thick, comfortable carpet in shades of gray. Gray acts as a neutral but adds a cooling touch to the room. Opalescent grays or creams can add a shimmery touch to the room that is soothing as well as beautiful. These light neutrals make your room feel both cozy and light and work well with both dark and light furniture. Trying to bring a little outdoors inside? Outdoor lovers are having fun with design trends that bring the outside in. More and more homes are incorporating nature and natural elements into their design, and carpets can really pull this look together. Nature isn't a neat and tidy sort of place so consider a carpet that mixes in some patterns. From big bold florals to a herringbone pattern, you can find a carpet that gives the room a distinct look that is also comfortable - a place you'll want to spend some time. 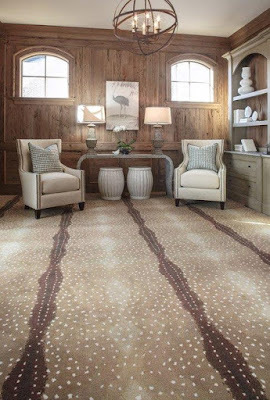 Learn about these trends and more from the design experts at Kermans carpet store in Indianapolis. Our showroom isn't staffed with sales people, it's staffed with designers that can help you find just the look you want for your next design project. 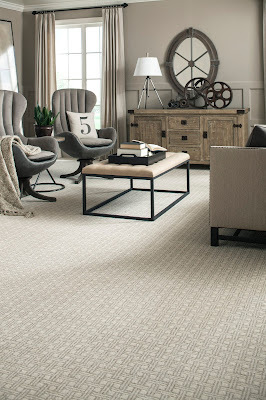 Stop by our Indianapolis carpet showroom and see for yourself.